Prof. D.Sc. (Econ) is the new rector of University of National and World Economy. He was elected for the post by the vote of 218 people of 308 voted delegates to the General Assembly of UNWE. 81 votes received the other candidate for rector`s post – Prof. D.Sc. (Econ) Plamen Mishev. Prof. Statty Stattev has occupied the position of First Vice-Rector of UNWE so far. “Thank you very much for the great confidence you voted to me and for the huge responsibility you assigned to me!”, said the new rector sharing his conviction that “it must be followed the path that has already been walking over the past eight years”. Prof. Stattev was greeted by Prof. Borislav Borissov, previous rector of UNWE who has occupied the post for two mandates. Before elections, the General Assembly of UNWE accepted the report of previous rector Prof. Borislav Borissov who outlined some fundamental achievements in the work of rector`s managing body over the last 8 years – UNWE was recognized as the leader among all universities in the country, as the leading university among universities providing economic education and also occupied exclusively prestigious 13th place in Europe and 31st place in the world according to „Ranking Web World Business Schools"! Prof. Borissov also pointed out that 3 of accredited professional fields have received the highest assessment “very good”, 3 Faculties and 16 Departments have been opened and transformed, and 16 specialities for Bachelor`s degree has been newly opened. Admission of students has been increased from 2945 students in 2003 up to 3446 now and the growth of new students for Master`s degree is from 2254 in 2003 up to 3319 in 2011. Attendants at the hall sent off by applause Prof. Borislav Borissov, the previous Rector of UNWE. Honorary Mark of Higher Education and Science Syndicate to the Confederation of Independent Syndicates of Bulgaria is bestowing its Chairwoman Assoc. Prof. Lilyana Valtcheva to Prof. Borissov. Prof. Stoyan Dentchev, Deputy Chairman of the Rectors Council and Rector of University of Library Science and Information Technology is awarding the previous Rector.  For exclusive achievements in his work as a rector Prof. Borislv Borissov was awarded by Honorary Mark of the Higher Education and Science Syndicate to the Confederation of Independent Syndicates of Bulgaria, Honorary Mark of the Students Council to UNWE, Honorary Mark of University for Library Science and Information Technologies. In turn Prof. Borislav Borissov bestowed Honorary Mark of the UNWE Rector to lecturers of the university as well as to the figures contributed for the university prestige and for the higher education development. General Assembly of UNWE discharged Prof. Mihail Dinev of his position the university Ombudsman and elected Prof. Blagoy Kolev as a new public defender. Prof. Dr.Stoyan Stoyanov was elected as a Chairman of the General Assembly of UNWE and Prof. Dr. Lalko Dulevsky - as a Deputy Chairman. Assoc. Prof. Dr. Violeta Tzakova was elected as a Chairwoman of the UNWE Control Council.